Master storyteller Ben Macintyre's most ambitious work to date brings to life the twentieth century's greatest spy story. Kim Philby was the greatest spy in history, a brilliant and charming man who rose to head Britain's counterintelligence against the Soviet Union during the height of the Cold War--while he was secretly working for the enemy. And nobody thought he knew Philby like Nicholas Elliott, Philby's best friend and fellow officer in MI6. The two men had gone to the same schools, belonged to the same exclusive clubs, grown close through the crucible of wartime intelligence work and long nights of drink and revelry. It was madness for one to think the other might be a communist spy, bent on subverting Western values and the power of the free world. But Philby was secretly betraying his friend. Every word Elliott breathed to Philby was transmitted back to Moscow--and not just Elliott's words, for in America, Philby had made another powerful friend: James Jesus Angleton, the crafty, paranoid head of CIA counterintelligence. Angleton's and Elliott's unwitting disclosures helped Philby sink almost every important Anglo-American spy operation for twenty years, leading countless operatives to their doom. Even as the web of suspicion closed around him, and Philby was driven to greater lies to protect his cover, his two friends never abandoned him--until it was too late. The stunning truth of his betrayal would have devastating consequences on the two men who thought they knew him best, and on the intelligence services he left crippled in his wake. 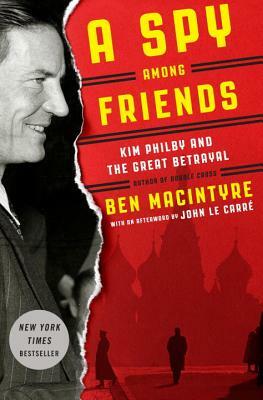 Told with heart-pounding suspense and keen psychological insight, and based on personal papers and never-before-seen British intelligence files, A Spy Among Friends is Ben Macintyre's best book yet, a high-water mark in Cold War history telling. BEN MACINTYRE is a writer-at-large for The Times of London and the bestselling author of Double Cross, Operation Mincemeat, Agent Zigzag, The Napoleon of Crime, and Forgotten Fatherland, among other books. Macintyre has also written and presented BBC documentaries of his work.